Our team of highly skilled and trained crew members are dedicated to providing quality commercial, industrial, shopping center, and residential services. 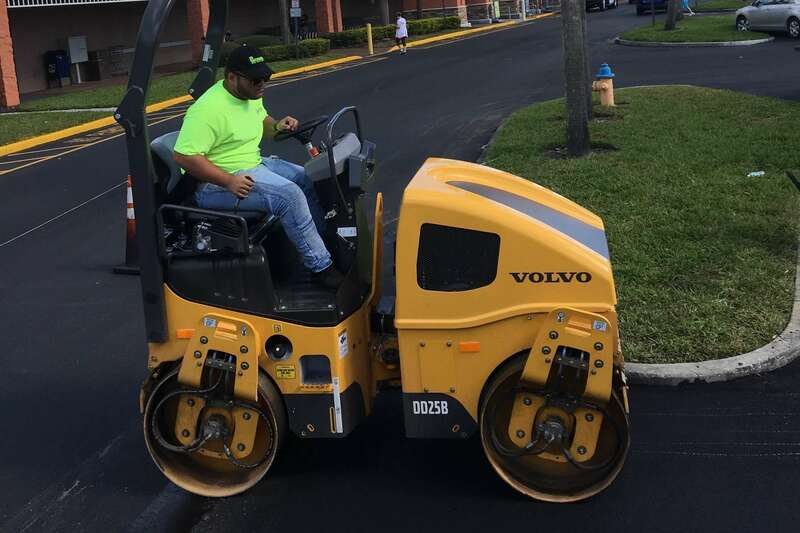 Asphalt paving, repair and maintenance, striping, sealcoating, excavating, and grading are all services we provide to beautify and rejuvenate your parking lot, roadway, or driveway. Call us today and we’ll send someone out to inspect your property and provide a free estimate. With over 30 years of experience and a highly trained staff, we have seen it all and are equipped to handle commercial, industrial, and residential projects. You need an asphalt contracting company that has the attention to detail necessary to detect and control any unexpected surprises that will inevitably arise. We also offer long term maintenance programs for you to take advantage of. Locking in a long-term maintenance program ensures that your price will always remain the same even when the market rates increase. 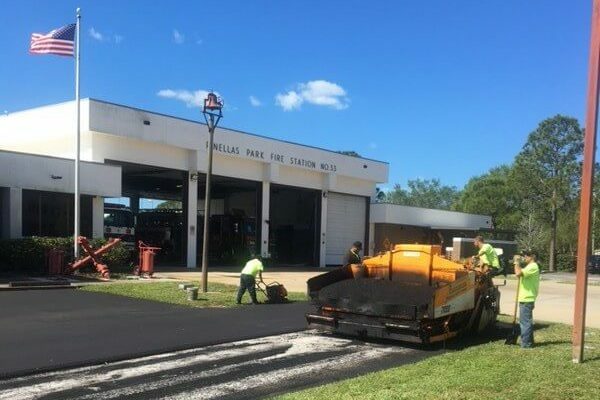 Not only is asphalt paving a cost-effective solution to installing parking lots, patching trouble areas, or resurfacing roadways, when done by professionals your asphalt pavement will last you years and years. We will meet all of your asphalt paving needs, going above and beyond your expectations. We provide new construction, asphalt overlays, restoration of old failing asphalt found on roadways, industrial centers, commercial parking lots and shopping centers, residential driveways, and golf cart or walking paths. Though asphalt is durable, it can suffer from stress and wear over time. Sand, salt, grease, gas, and oils can also break down in the asphalt’s components and base foundation, further deteriorating the pavement with potholes and cracks over time. Asphalt repairs can be relatively inexpensive, and the result is very appealing if done correctly. 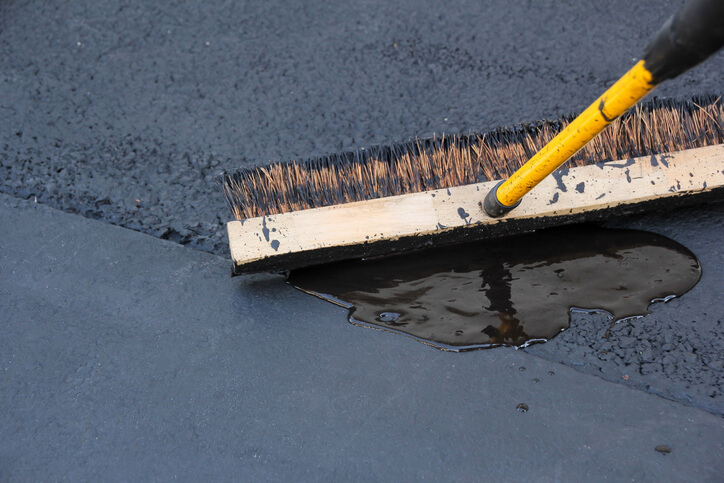 Repaired asphalt, in most cases, outlast the surrounding surface areas since it is already older than the repair. If there is any localized damage to your parking lot or roadway, don’t wait to fix it. Small cracks and sunken areas will eventually become big problems if left untreated. We will patch, repair, or seal any problem areas in your pavement so that you get the most out of your investment. 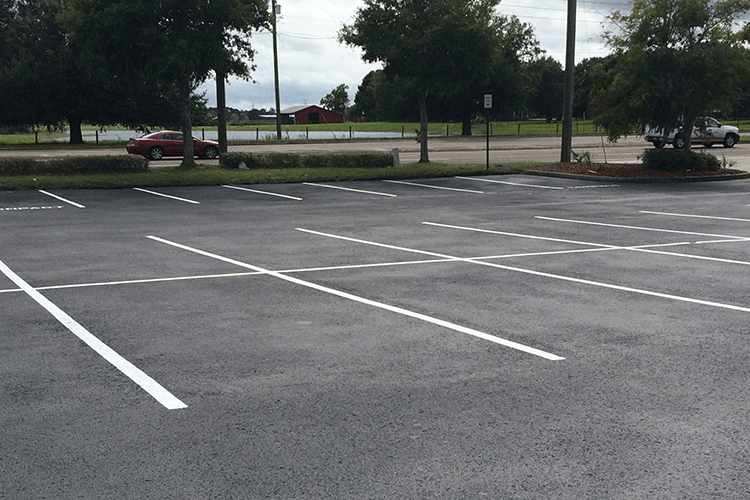 Pavement striping is critical to provide organization to your parking lot or roadway. Our highly skilled striping team pay the greatest attention to detail, using only the best products and methods available. Attention to detail is what sets us apart from the competition, knowing that at all costs our clients will have everything that is desired when it comes to parking lines with uniform applications of laser accurate applied paint that will last and stand the test of time and traffic. We also install all signs and are an ADA code compliant contractor. Crack sealing is a major player when it comes to saving or protecting your investment. Outside elements can be harsh to your asphalt pavement and once cracks have developed, moisture can then seep through and penetrate the underlying base structure of the pavement causing further damage and leading to major repairs to the asphalt and base materials. Crack sealing with a high quality hot rubber material can help prevent this by properly cleaning the cracks with high pressure air and applying the crack sealant to a dry, clean crack. Hot rubber crack sealers are manufactured especially for this. They are applied at high temperatures, some varying to 400 degrees Fahrenheit, and flow into the crack as a thin liquid to fill every void from the bottom to the top. The end result is a flexible, sealed crack that moisture can no longer penetrate and a well-protected asphalt. 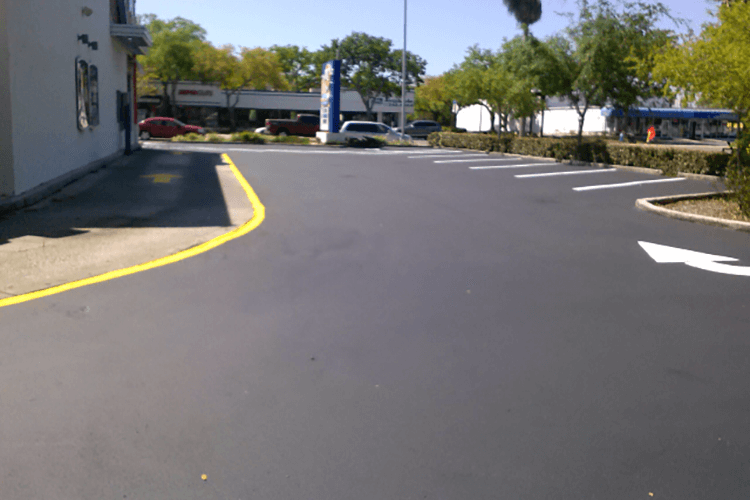 We have numerous Sealcoat products and application methods to meet any budget. When it comes to protecting and beautifying your property, you want only the best money can buy. We are always researching new technology and products in this area to ensure our clients are getting the best for their budget. Asphalt can become dried out and weathered from the Florida rain, sunshine, and traffic. Sealcoating asphalt replenishes the surface with protective agents to help keep the surface stone locked in place and to stop raveling. From this, the asphalt is protected from nasty gas, oil leaks, or spills that will damage unprotected asphalt. Sealcoating also keeps the asphalt surface resistant to moisture, protecting and beautifying the surface with a rich black color that enhances any property. We suggest sealing your property every two to three years depending on traffic and wear and tear. We offer multiyear maintenance programs to keep your property looking pristine! 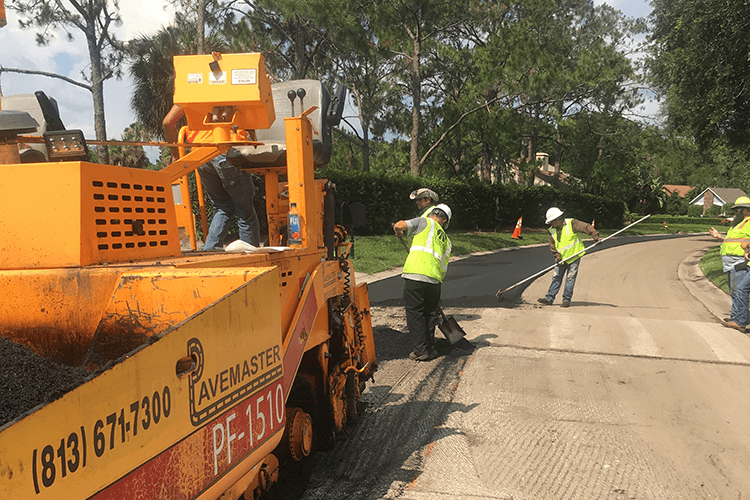 We also offer asphalt milling or planing, which is a cost-effective way to remove existing asphalt completely or to make room for repairs or an asphalt overlay. This also helps to stop the new asphalt from sliding when under pressure from high weight rollers and compaction machinery, helping to achieve density of the new surface. 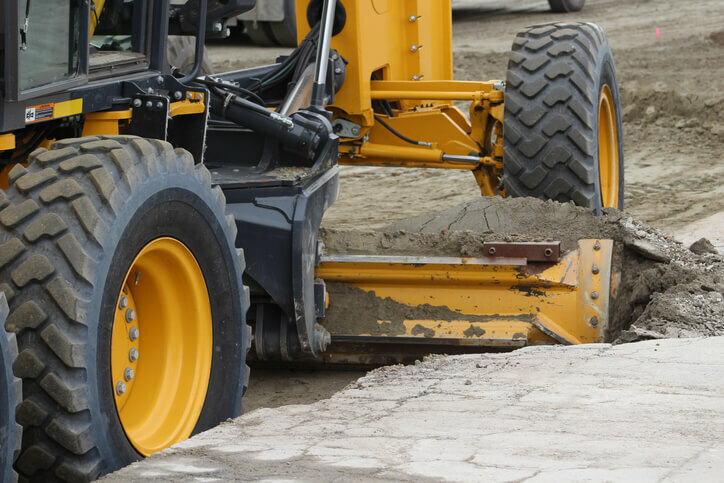 We use the latest equipment and machinery in the industry to ensure that our excavation and grading services are done in the safest and most efficient way possible. Our precision grading machinery along with laser levels and transits result in the best grade available. We offer grading of any and all types, from dirt to a variety of base materials, existing materials, or materials imported from local suppliers.